All I'll say is Nope! Ain't watching the homos at 1/2 time either. did they... just... crush a J truck for that debacle? They could have just been honest about the whole thing. Announcer stands center, J10 to the right and Wrangler to the left.
" We could have brought you one of these but instead we brought you this POS " now pointing to the Wrangler. And no J10 would have been harmed. Check the description on the video. 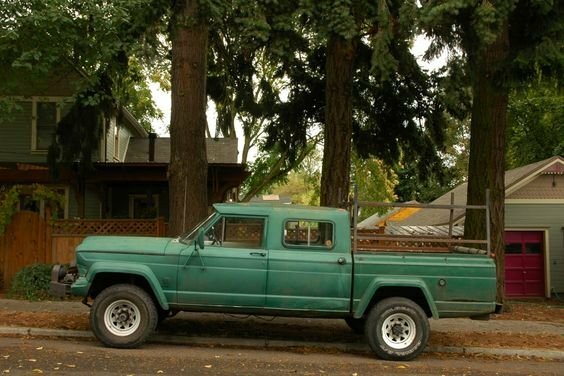 This inoperable 1963 Jeep Gladiator depicted here was sourced via an online scrap sales site. We wish we could have driven it while it was still alive! Looked pretty far from junk to me. Yeah... Just makes me dislike the new one more. Ummm.... I’m probably in the minority here. I kinda like it. The price tag? No. The actual functionality of that bed to haul items around? No. Stealing the Gladiator name for that? No. Even the rehashed music( I think from a Nissan commercial)? No. Is your average blue collar guy even gonna justify paying that kinda money out for a wannabe Comanche? Ehhhh, probably not, although some will. I think it’s at least a step in the right direction. I still kinda dig it. I agree. I like it wish it could be affordable. Hopefully they kept the Comanche name for another truck later. One closer to what we all would like to see. I mean I can hope right. I'm guessing they will be closer to the JL. Again, no. My main reason is the "target audience" trying to be reached. The vast majority of them have no freaking clue as to what the Gladiator was, let alone care. Enthusiasts and die hards like us know, but by and large our demographic is just a tiny blip on their marketing radar screen that we don't matter. They're not going to make bank on us, and they're not even trying to. It's just a legacy name from a legacy brand that they're just trying to cash in on. I genuinely got pissed off watching it get put into the crusher, there's no other way I could feel about it. The new generation won't give two craps about it, though. Just open your wallet. And get off my lawn. Rant over. I think it’s at least a step in the right direction. Here's where we part company. IMHO, it's definitely a giant step in the wrong direction. My main reason is the "target audience" trying to be reached. The vast majority of them have no freaking clue as to what the Gladiator was, let alone care. Enthusiasts and die hards like us know, but by and large our demographic is just a tiny blip on their marketing radar screen that we don't matter. They're not going to make bank on us, and they're not even trying to. This is exactly the point. They are a business, their goal is to make money and they feel there are plenty of people who are willing to pay their price for a Wrangler with a bed. How would soccer moms take their kids to practice in a two door truck? 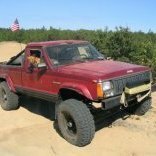 FCA already has a truck for actual truck use, the Ram although it too is getting "plump". Speaking at the Detroit Auto Show on a wide range of topics, Fiat Chrysler CEO Sergio Marchionne (now deceased) eventually turned his ramblings toward Jeep’s upcoming light truck. According to Driver, he said that Jeep will take a similar approach to the new truck as it took with the Jeep Renegade, marketing it as a “lifestyle vehicle.” However, unlike the Renegade, the new pickup will be sold at a premium price well above similarly sized trucks like the Chevy Colorado and the new Ford Ranger—two trucks that Marchionne says won’t be competing with the new Jeep. It's a nice truck; maybe something to compete with the Tacoma that everybody and their brother is driving these days. But it'd be tough spending $50k on a new Jeep knowing what half that would do if it were spent on an MJ or J20 restoration. LOL. But you could say the same about any new car, I guess. I actually like this, and would love to get one to tow my MJ, Mustang, and Chevelle. 30k...yes. 35k... okay. 40k... better be well equipped. 45-50k? At that point, I will take an F150 or ZR2. "New" is rarely improved. Calling that thing a Gladiator is equivalent to Ford's "Mustang II" ... just wrong. 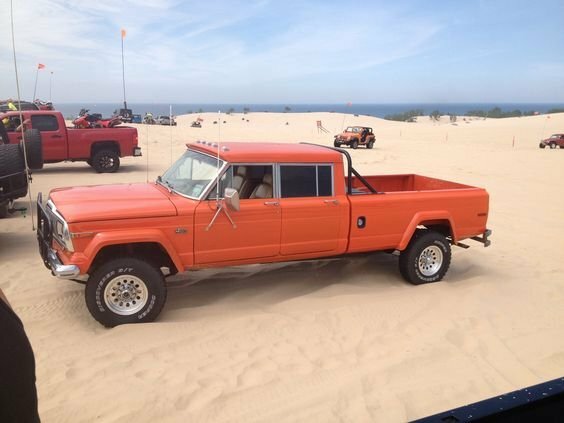 That orange crew cab will need to be registered in 2 states due to that wheelbase..........wow!